What is Duke basketball? Duke basketball is tradition. It’s 105 years, four national championships, 15 Final Fours, 55 All-Americans, 23 first round NBA draft picks. It’s playing home games in the holiest basketball cathedral known to man. It’s having fans that can remember specific plays from a given game that might span back years, let alone decades. It’s men and women who graduated in the 60’s and 70’s and can still remember the cheers and jeers that are quintessential to the Duke basketball experience. What is Duke basketball? 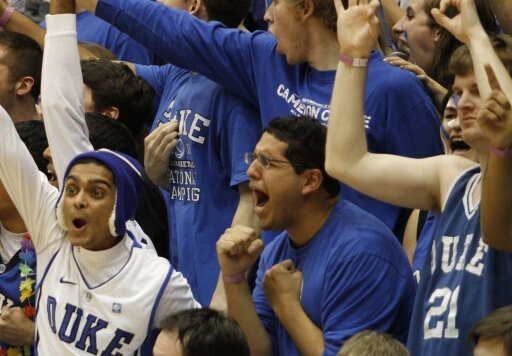 Duke basketball is passion. It’s about fans who are more than proud to call themselves Crazy and wouldn’t have it any other way. It’s striking fear into the heart of every opponent with a sea of the most beautiful blue on the face of the earth. It’s having fans that will travel thousands of miles just to catch a glimpse of their team play. It’s having students at a top ten university that are willing to wake up long before the sun to stand in line for an exhibition game against a team they’ve never even heard of. 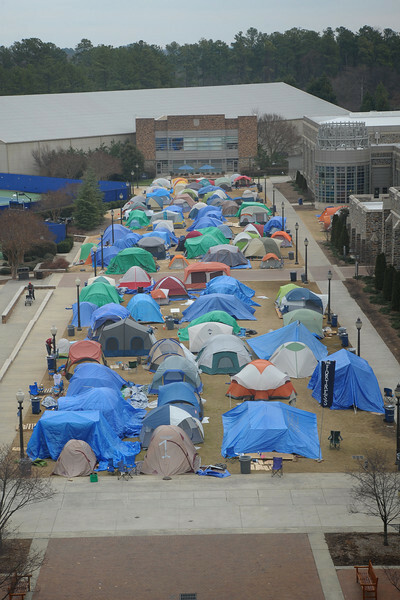 It’s looking forward to sleeping in a tent and enduring six weeks of mild (let’s not get ahead of ourselves here) Carolina winter just so we can tell the Tar Heels to Go To Hell. What is Duke basketball? Duke basketball is my life. Some of my freshman classmates have been Duke fans for a couple months, some of them maybe even fell in love with the school a year ago before they applied Early Decision. I’ve been a Cameron Crazie since the day I was born. I was a month old when I watched Christian Laettner hit the shot against Kentucky. Every winter since I can remember, Duke basketball has been part of my routine. No matter what important work there was to be done, the Duke game would always come first. Going to a high school that sat just down the block from Villanova’s campus, I was not afraid to let my classmates know that I wouldn’t be jumping on any hometown bandwagons, and in return they felt free to remind me of the four or five times a year that we actually lost a game. Bearing the brunt of that abuse was the price I paid for being better than them in every possible way come March. Now 18 years later I sit where countless freshmen before me have, milling away in piles of schoolwork while all I can think about is basketball season. After all this time I have finally arrived, Countdown to Craziness is upon us. It was great hearing President Brodhead and Maya Angelou speak during O-Week, but in all honesty I consider Countdown to be the truest of freshman convocations, the first time in a new school year where all of Duke comes together and does what Duke does best—basketball. I’ve been lucky enough to get to games almost every year since middle school, whenever Duke would play a neutral site game in the New York area or play Temple or Penn on the road. But I’ve been missing the most important piece to my Duke basketball experience, I’ve been missing Cameron. Friday will mark the first time I’ve taken in a Duke basketball event at Cameron Indoor Stadium, a moment I’ve dreamed about since I was young enough to realize how important Cameron was to the basketball world. Even thinking about it now, trying to convince myself that this time is finally here sends shivers down my spine. There is one word I can use to describe what I think stepping inside Cameron will be like—electric. The electricity, the buzz, the anticipation will be so thick you could reach out and grab it and squeeze every ounce of glory out of it. It will be about then, when 10,000 voices become one, when time will seem to stop. And if you look just closely enough, you’ll see 1700 wide-eyed members of the class of 2015 do that same double take they’ve done since the moment they got here. They’ll look around at the most beautiful sight in the world, a sea of their royal blue brethren, and tell themselves, ‘Wow. I am the luckiest person in the world. I get to be a part of this.’ And after a moment, they’ll come back down to earth, and we’ll yell. Really, really loud. Because that’s what Cameron Crazies do.